Every time that I make this cider, I am reminded of my mama. This is her cider and the one that I grew up sipping. I love when I walk into her house and can smell the warmth of the spices; it is a familiar smell during this time of year. I now make her cider for my family and with each sip taken; I hope that I am passing on to my little ones a little bit of my mom and her warmth. In a large pot, bring 1 quart of water and mulling spices to a boil. Lower heat and simmer for 1 hour. Add sugars to water and mulling spices and simmer 30 minutes to an hour. Place a fine strainer over a large pot and pour the water sugar mixture through the strainer into the pot, discard the mulling spices. Add the lemon juice, orange juice, and apple juice to the pot and stir to combine. Heat and serve. I really do enjoy a good burger and I think this one ranks near the top as one of my favorites. Heat oil in a medium skillet over low heat. Add onions and cook, stirring frequently, until they are a deep golden brown, about 25 minutes. Set aside. Mix the mustard and mayonnaise together and set aside. Divide the meat into 4 equal portions (about 6 ounces each). Form each portion loosely into a 3/4-inch-thick burger and make a deep depression in the center with your thumb. Season both sides of each burger with salt and pepper. Cook the burgers on the grill. In the last minute of cooking top each burger with a slice of Swiss cheese and close the grill to allow the cheese to melt. Spread a layer of the mustard sauce on both sides of the toasted (and buttered if you are like me) bun. Places grilled burger on bottom bun and top with caramelized onions. Place top bun on burger and eat! I had always bought hamburger buns until these things came along. My sister Stephanie had invited me over for lunch and made me a pulled pork sandwich with coleslaw, sandwiched between a butter toasted bun. It was so nice not having to make my own lunch and even more awesome because it was sooo good! With a little planning these buns are easy to make and are sooooo worth it. Beware; you may never want to buy store bought hamburger buns again! In a large bowl, whisk flours and salt. Add butter and rub into flour between your fingers, making crumbs. Using a dough scraper, stir in yeast mixture and beaten egg until a dough forms. Scrape dough onto clean, well-floured counter and knead, scooping dough up, slapping it on counter and turning it, until smooth and elastic, 8 to 10 minutes. The dough will be one the sticky side so it can be a bit messy, but keep in mind that the more flour you knead in, the tougher the buns will get. Try to leave them tackier than you would a round loaf. Shape dough into a ball and return it to bowl. Cover bowl with plastic wrap and let rise in a warm place until doubled in size, one to two hours. Line baking sheet with parchment paper. Using dough scraper, divide dough into 8 equal parts. Gently roll each into a ball and arrange two to three inches apart on baking sheet. Cover loosely with a piece of plastic wrap lightly coated in nonstick spray and let buns rise in a warm place for one to two hours. Set a large shallow pan of water on oven floor. Preheat oven to 400 degrees with rack in center. Beat remaining egg with one tablespoon water and brush some on tops of buns. Sprinkle with sesame seeds, if using. Bake, turning sheet halfway through baking, until tops are golden brown, about 15 minutes. Transfer to a rack to cool completely. *I always use my kitchen aid when I am making the dough. I had a sandwich the other day while eating lunch out with a friend. I liked the sandwich enough that I thought I would do a little recreating at home and make my own version. I had high hopes that this sandwich would be great and was looking forward to eating it all day. I knew after one bite that it was everything I hoped it would be! Preheat broiler to high. Cut ciabatta roll in half. 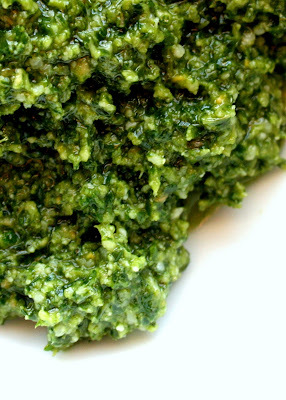 Spread a layer of pesto over both cut sides of bread. On the bottom half of the ciabatta roll, layer the ratatouille and then the fresh mozzarella cheese. Place on a baking sheet cut sides up and place under broiler until cheese is melted. Part way through broiling; turn the top part of the roll over so that it can get a little bit of crunch. Eat and enjoy (it can be a bit messy)! Bring water to a boil in a pot. Lower skewered garlic into water; boil for 45 seconds. Immediately run garlic under cold water. Remove from skewer; peel and mince. Meanwhile, toast nuts in small, heavy skillet over medium heat, stirring frequently, until just golden and fragrant, 4 to 5 minutes. Place basil in heavy-duty, quart-size, zipper-lock bag. With a rolling pin roll over zip-lock bag until all leaves are bruised. This is a very delicious sandwich! It is such a perfect combination of flavors (sweet, smoky, salty, and spicy)! Preheat your broiler to high. Spread slices of bread with apple butter. Top half of the bread slices with thinly sliced ham and slices of gruyere cheese. Place on a baking sheet under the broiler. Broil for 3-5 minutes until the cheese is melted and bubbly. Place the top half of the sandwich onto the bottom half that is in the oven for just a minute or so (watch carefully, it will burn in a hurry). This lets the top of the sandwich to get a little crispy and brown around the edges. Before eating, I like to open my sandwich and top with arugula. Serve with Spicy Mustard. This past weekend was my birthday weekend. On Friday, I went to lunch with my mom, sisters (wishing Stephanie was here and not in Hawaii, I've been missing her like crazy), my sister-in-law and Grandma. We went to one of my favorite places, Pizzeria 712; I know it was shocking to everyone that I picked that place. Then on Saturday I got to spend most of the day with Todd. We started the afternoon off with a movie, then headed to Tony Caputo's for some vinegar, hand pulled mozzarella, prosciutto, and chocolate. To finish the night off we enjoyed a very delicious meal at Pago. The entire time Todd and I were eating, I had this tight, excited feeling that I get when I eat really good food; I couldn't stop smiling. On my actual birthday, for breakfast, my little family and I ate Burg's French toast (with a Traci Magleby spin) topped with peaches and whipped cream. For dinner we ate a really great salad, pizzas and a very rich chocolate cake with homemade vanilla ice cream. It was a really great weekend filled with two things that I really love, family and food! In a small bowl, combine the mustard, vinegar, and salt and whisk to blend. Add the olive oil and whisk vigorously to emulsify. Taste, and adjust as needed. Place the arugula in a large bowl and add a spoonful or two of dressing. It's best to err on the side of underdressing at first. Using two forks or, preferably, your hands, carefully toss the arugula, taking care to handle it as lightly as you can, since it bruises easily. Taste, and add dressing as needed. Divide the dressed arugula among 4 plates. Serve with small bowls of chopped pistachios and chocolate on the side, allowing each eater to sprinkle his or her salad with a bit of each. Preheat your oven for 45 minutes with pizza stone inside, to 500-550 degrees. With you dough create 12" round. Place on flour dusted pizza peel (I use the back of a sheet pan). Brush with olive oil and dust with sea salt. Break up fresh mozzarella on top of pizza, add roasted asparagus. Slide onto pizza stone and bake for 3 minute. Open oven and as quickly as possible pour the eggs onto two or three different places around the pizza. Bake for another 7 minutes or until golden and eggs are cooked to your liking. We shoot for a semi-soft yolk. Remove from oven and grate Parmigiano over top. Drape 4-5 slices of prosciutto on top of pizza. *When I poured the eggs on to the pizza, I had a hard time getting both of my eggs to stay on the pizza. One of those darn eggs wanted to slide off onto my pizza stone. In an attempt to keep the egg on the pizza, I created a dam with a piece of asparagus and it seemed to do the trick. Place pizza stone on bottom rack of the oven (if you have one). Preheat oven to 500 (or the ovens highest temperature). In a medium skillet, cook the bacon over medium heat until the fat is rendered and the bacon is crisp. Remove with a slotted spoon and drain on paper towels. Add onion to skillet and cook until onions are golden and caramelized. Set aside. Shape pizza dough into desired shape and place on a floured and cornmeal dusted cookie sheet that has been flipped upside down. Layer the toppings as follows, caramelized onions, bacon, and spoonful’s of ricotta to dot the pizza. If you don't have a pizza stone, place cookie sheet (with pizza on it) on the bottom rack of the oven and bake until crust is golden. If you have a pizza stone, very quickly slide the pizza from the cookie sheet to the pizza stone (this is always a little bit scary for me). Bake until crust is golden brown, about 10-12 minutes. Bring about 2 inches of water to boil in bottom of double boiler; reduce to simmer and maintain throughout cooking process. Set top of double boiler over simmering water, add 4 cups boiling water. Add salt, and then gradually sprinkle cornmeal into water, whisking constantly to prevent lump formation. *I don't own a double boiler so I set the saucepan that holds the polenta on an ovenproof ramekin, inside a wider, deeper pot and surround it by simmering water (I found this tip on orangette and it works great). Heat a large sauté pan over. Add sausage and cook until browned, stirring to crumble. Once the sausage is cooked, add the onion, carrots and celery and sauté until vegetables soften, about 5 minutes. Add tomatoes and their juices; simmer gently until sauce thickens, 20 to 25 minutes. Season with salt and pepper to taste. Serve over soft polenta with a dusting of parmesan cheese. I love fall and with fall comes pumpkin, the two go hand in hand. These pumpkin doughnut holes are a bite of fall wrapped in cinnamon and sugar. Preheat oven to 350 degrees F. Spray each cup in a 24-cup mini muffin tin with baking spray or butter generously. In medium bowl, whisk together flour, baking powder, salt and spices. In a separate bowl, whisk together oil, brown sugar, egg, vanilla, pumpkin and buttermilk until smooth. Add wet ingredients to dry ingredients and mix until just combined, don't over mix. Divide batter evenly among muffin cups. Bake at 350 degrees F for 10-12 minutes or until a toothpick comes out clean. While the muffins bake, melt butter in one bowl and combine sugar and cinnamon in another bowl. Remove muffins from oven and cool for 2 minutes, or until just cool enough to handle. Dip each muffin in melted butter and coat completely, then roll in cinnamon and sugar mixture. They are especially delicious while they are warm! I bought my last bag of peaches from Allred's Orchard a couple of days ago and although I really love that fall is here, I am sad that my favorite breakfast is about to become a thing of the past (at least the peach part). I am in love with homemade yogurt (and so is my family)! It is delicious, creamy and inexpensive to make. Todd and I love it topped with fresh peaches and granola, Stella loves it on its own, Noah stirs strawberry jam into his and Preston isn't particular. Making yogurt is not difficult and totally worth the time and the money that it saves! Place 4 quart glass canning jars, four lids, and four screw-tops in a large pot. Fill with an inch of water; cover with lid and heat to boiling. Boil ten minutes. Leave the lid on the pot and move it off the heat until you are ready to use the jars. Pour one gallon of whole milk into a large, heavy bottomed stockpot. Over medium heat, warm the milk to 190 degrees F. Make sure to do this slowly, you don't want the milk to scourch on the bottom of the pan. Place the pot in a sink filled with cold water and let the milk cool to 120 degrees F. While the milk is cooling, stir in the agave nectar and vanilla. Once the milk has reached 120 degrees F, stir in the cup of yogurt starter using a whisk. Stir well to ensure that the starter is thoroughly incorporated into the milk. Pour the milk into jars and put the lids and bands on. Place them in a cooler. Heat one gallon of water to 120 degrees F and pour into the cooler. Shut the cooler lid and leave in a warm place for 10 hours (don't open the cooler lid). When the 10 hours are up, place the jars of yogurt in the refrigerator. *Once I've added the yogurt starter and the agave, I end up needing a small jar in addition to the 4 quart jars because I have a little more than 4 quarts of the milk/yogurt mixture and don't want any to go to waste. I've had this recipe sitting in my "to try" pile for about a year and today was the day, a cold rainy October day. It was perfectly delicious; warm, comforting and tasted like fall, I felt happiness! Position a rack to the center of the oven and preheat to 375 degrees. Butter 12 individual ramekins or a 2 1/2-3 quart baking dish. In a large sauté pan, melt the butter with the olive oil over medium-high heat. Sauté the onions until tender, about 5 minutes. Add the sliced fresh mushrooms and sauté just until they begin to give off some liquid, about 5 minutes more. Season with 1/2 teaspoon salt and fresh cracked pepper. Remove from the heat and stir in the fresh herbs. In a large bowl, whisk together the eggs, milk, gruyere, and 1/4 cup parmesan. Whisk in 1/2 teaspoon salt and a few grinds of fresh cracked pepper. Add the bread cubes and let soak for 10-15 minutes, until most of the liquid is absorbed. Fold in the mushroom mixture. Turn the bread pudding into the prepared baking dish. Sprinkle with 2 tablespoons parmesan cheese. Bake uncovered until puffed and golden and a knife inserted in the center comes out clean, anywhere from 40-60 minutes depending on the size and depth of your baking dish. Let cool for 15 minutes before serving. Garnish with parsley. *I gave my bread pudding a very light dusting of freshly grated nutmeg before I put it in the oven. This salad was the perfect accompaniment to my wild mushroom bread pudding. This salad is definitely a fall favorite (even my husband who doesn't like squash, loves this salad)! Place the butternut squash on a sheet pan. Add 2 tablespoons olive oil, the maple syrup, 1 teaspoon salt, and 1/2 teaspoon pepper and toss. Roast the squash for 15-20 minutes, turning once, until tender. Add the cranberries to the pan the last 5 minutes. While the squash is roasting, combine the apple cider, vinegar, and shallots in a small saucepan and bring to a boil over medium-high heat. Cook for 6 to 8 minutes, until the cider is reduced to about 1/4 cup. Off the heat, whisk in the mustard, 1/4 cup olive oil, 1 teaspoon salt, and 1/2 teaspoon of pepper. Place the arugula in a large salad bowl and add the roasted squash mixture and the walnuts. Spoon just enough vinaigrette over the salad to moisten and toss well. Season with salt and pepper and garnish with shaved Parmesan. Serve immediately and enjoy! My sister Stephanie first tried this recipe when she moved to Hawaii and was on the hunt for good whole wheat bread. It is delicious right out of the oven; a big thick slice with a layer of melted honey butter, yum! In a large bowl, whisk together the water, honey, and yeast. Allow to sit for 15-20 minutes. Stir in the oil, salt, and white flour. Slowly stir in the remaining whole wheat flour until the dough becomes soft, but not too sticky. Knead until elastic. 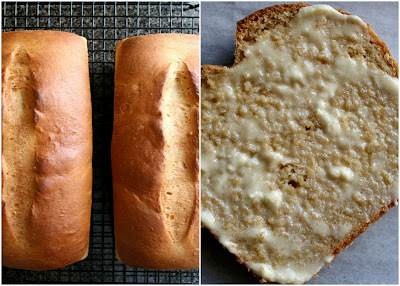 Divide dough into two pieces, shape into loaves and place into 2 large, well- greased bread pans. Allow loaves to rise for 40-45 minutes on top of your preheating oven. Just before baking, use a knife (I use a razorblade) to cut a single slice right down the center of the bread. Bake in a preheated 350 degree F oven for 45-50 minutes. *I tent my loaves with foil part way through baking so that the tops of the loaves don't brown too much. *The original recipe calls for 1 cup of honey, but I only use 1/2 cup.